1. To benefit health through public participation in sport by the provision of recreational facilities and activities. 2. 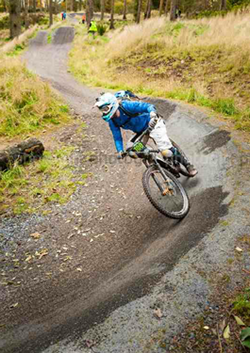 To improve conditions of life and mental wellbeing for participants in active leisure pursuits including mountain biking, waking and horse riding. 3. To advance education, improve the economic potential and support rural regeneration to improve the life chances for children, young people and families. 4. To advance environmental protection or improvement by operating in an eco friendly manner	in all activities while enjoying the built and natural environment and protecting it for future generations through sustainable practices. 5. To increase participation in Mountain Biking recreationally and in a sporting capacity while aiming to develop future athletes from a grass roots level. 6. To increase participation in cycling and positively affect the amount of journeys made by bicycle. Scott has been involved in cycling all his life and in Mountain Biking for the last 15 years. Scott started with Cross Country then a chance meeting made him pick up some tools and start trailbuilding, which he has been doing for around 10 years. Since then riding trips to the Alps made him focus more on the Downhill and Freeride disciplines fo the sport. Scott is qualified to the MBLA's Trail Cycle Leader Standard and the highest level of Cycling Scotland's GoMTB skills development program - Level 5. He is also qualified in outdoor first aid and cycle mechanics to Velotech Silver +. Ryan has also been involved in cycling all his life and in Mountain Biking for the last 14 years. Ryan has always been interested in all disciplines of the sport but mostly Downhill and Freeriding. With numerous riding trips to the Alps Ryan is a competant all round rider. Ryan has been trailbuilding for around 10 years at a variety of locations, including Falkland Bike Park, and during this time has gained valuable knowledge of how to make a trail really flow.